When writing posts in WordPress it is often useful to have related posts categorized together. This way if you want to see more post on the same subject it is easy to find. With the categories feature on WordPress you can do this. If you are viewing the WP Admin part of your WordPress site take your mouse and hold it over the sidebar on the area that says “Posts,” then once it appears move your mouse over to the area labelled “categories” and left click . Now you should be in the categories section. Viewing this page you should now see a section that say “Add New Category” on the left of the page and on the right a box with your current categories you have made so far (if you’ve made any). If you have not made a category yet you should have a default category that says something like “uncategorized,” and if you haven’t made any other categories then this is where all your posts live. Lets focus on the “Add New Category.” First Enter the name you want the category to have, next you’ll see a drop down box called “Parent,” this box gives you a selection to relate the article you are creating to another. For example; If I revolve my site around Football and have a category named “Football,” if I make a category called “How to Throw a Football” I might relate the two using the Parent function. Next, below parent function you will see a place to put write a description. This is used to give a little more information on your category. Lastly, just click the “Add New Category” button to officially create a category. Now that you’ve created a category, all that’s left to do is use it! When writing a post look to the right on the sidebar and scroll down to the section called “Categories.” You should see one category already selected which would most likely be your default category. Now all you have to do is click on the box you want to set as categories that you think relate to the post and the content within it. That’s how you use and make new categories. Categories are an essential part of WordPress. They help group like topics and posts together, which makes it easier for people to search by topics that interest or pertain to them. Categories are not to be confused with tags. Categories tend to be based on broader topic points than the tags that people enter for their posts. Tags: A group of descriptive words which provide a useful way to tell readers what a post is about. They simply make it easier for people to find your content. WordPress Support – What Is A Tag? 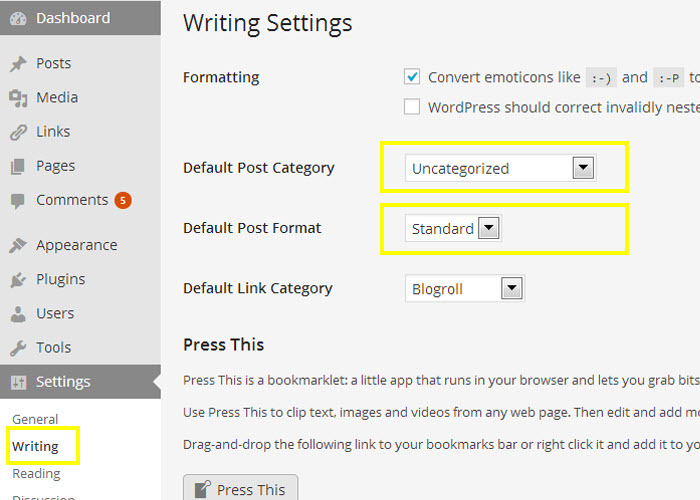 To change the default post category for your posts in WordPress, go into the Settings > Writing. Choose your default category in the drop-down menu. Go to Posts > Category and remove the Uncategorized or unwanted former default category if desired. Do you know how to use tags properly when making a post? Tags are easy to use and a very powerful tool. They pick out topics that pertain to the post they correspond with and guide your readers to related topics. They are not, however, to be used like categories, which are similar in definition but are used much differently. Tags are your site’s index words. Categories are the table of contents. Understanding the differences between categories and tags in WordPress is extremely important. The topic of categories vs tags often causes confusion for individuals that are new to WordPress. To get started, they are both used as a way to group content together. They also provide an easier way for visitors to navigate your site and find related posts. Now, let’s look at each one in more detail. My professor, Lorelle VanFossen, says it best, “categories are your site’s table of contents.” When creating categories, you should be thinking about how you can provide easy navigation for your visitors. Categories provide a broad grouping of post topics. A list of categories should give visitors a clear idea of what your blog is about. They should also provide readers with an easy way to find posts that are about related topics. Once again, I’m going to have to quote Lorelle VanFossen in saying that “tags are your site’s index words.” Essentially, tags are your site’s micro-categorization. They are more specific than categories and they should give readers a clear idea of what a specific post is about. A single post will often have multiple tags, which provides insight on what specific topics are discussed in that post. Tags also make navigation easier. For example, if a visitor only wants to read about HTML, they could click on the “HTML” tag and view all posts that have been assigned an “HTML” tag. This is easier than searching through a category such as “Web Design” in order to find posts that deal with HTML.